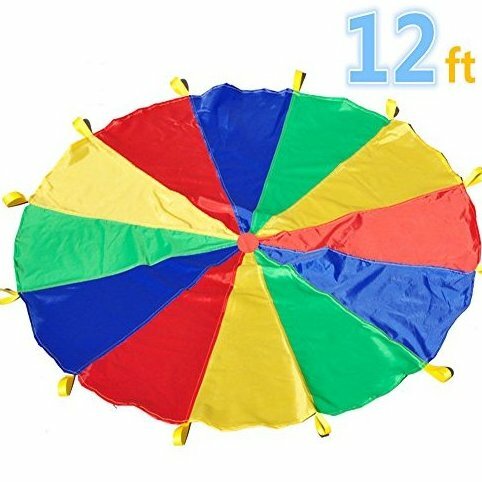 Parachute size: 12-feet diameter, 12 separate handles spaced evenly around for group play(Teach turn-taking and cooperation). Promotes cooperative group play while helping to build muscles,Encourages cooperative play while building upper-body strength. Reinforced mesh center allows ample airflow. Great at birthday parties and picnics(indoor or outdoor play). High-quality, durable 210T polyester taffeta fabric with reinforced web handles, Includes carry bag.